Antique Country Chairs are more characterful and usually from the periods of Georgian and Victorian in woods such as Oak, Fruitwood, Elm or Pine as these were locally sourced woods. These chairs will have years of use and come with a lovely patina and here at Antiques World, we preserve this by sympathetically waxing using natural beeswax. They can come in many forms from a Windsor chair, to a ladder back with either a figured solid seat or rush seating. These types of antique chairs will suit most country homes or Cottages, sat around a rustic dining table and the beauty about country antiques like this, is you can use them and not worry about them being marked as you simply wax over if they get scuffed. Our large antique furniture showroom is based in Clitheroe in Lancashire where we display lovely selections of Country furniture for sale along with more finely finished pieces so you are welcome to view either online or in our showroom as we get new stock arriving daily. 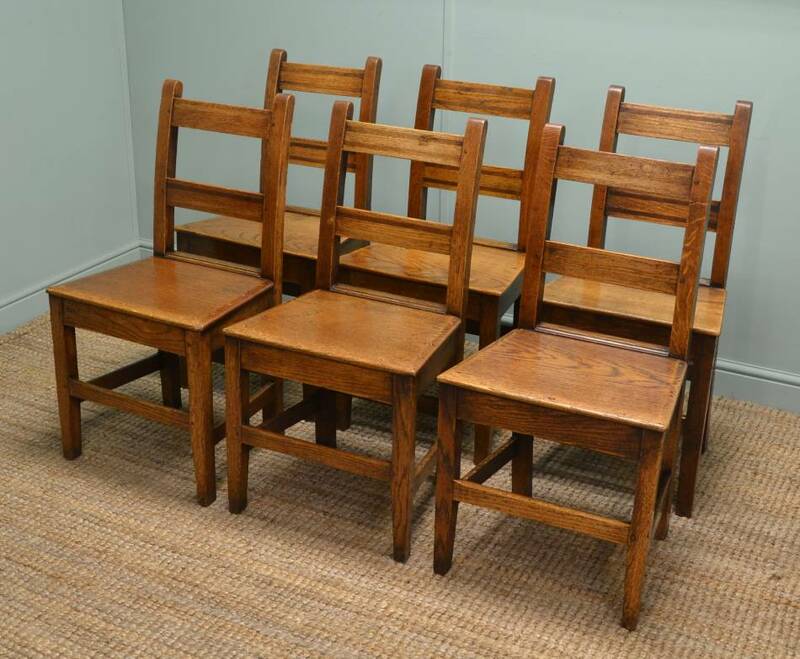 Below are a few examples of country chairs that we have sold, if any particular style looks of interest, let us know and we can try to find you something similar. 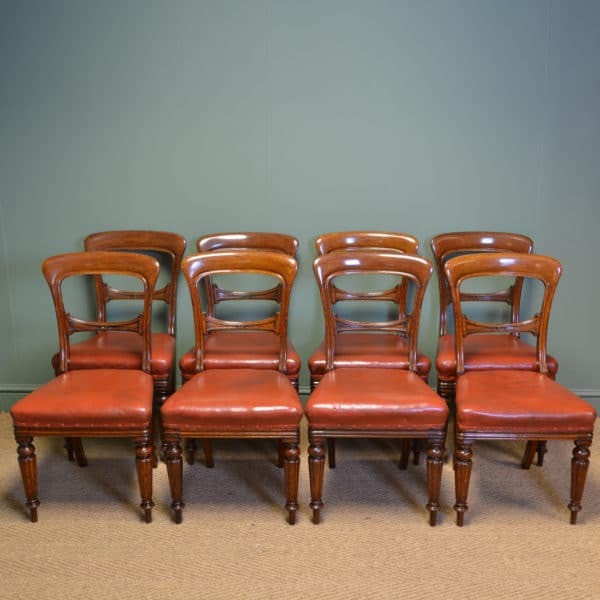 Set of Six Victorian Elm Antique Country Kitchen Chairs. 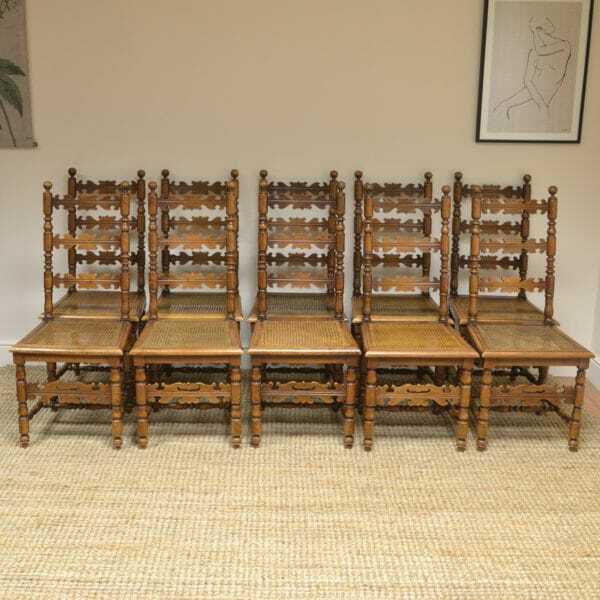 Dating from the late Victorian period, circa 1900, this set of six antique country chairs are constructed from elm. 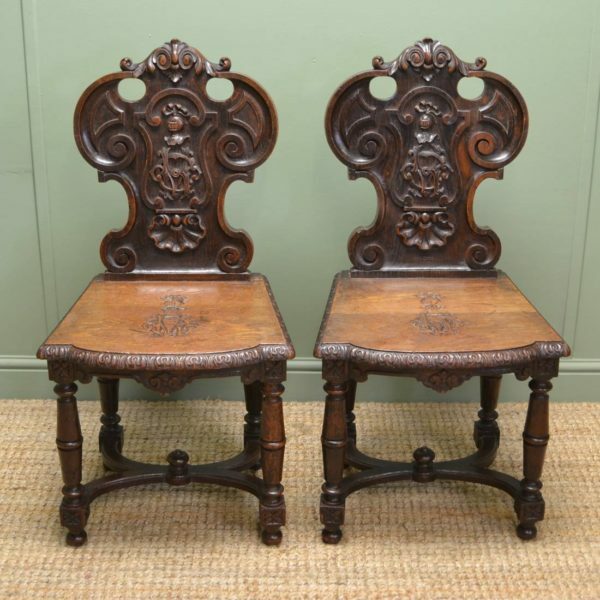 They have curved decoratively carved backs above beautifully figured elm seats and stand on turned legs with ‘H’ stretchers for that all important added stability. 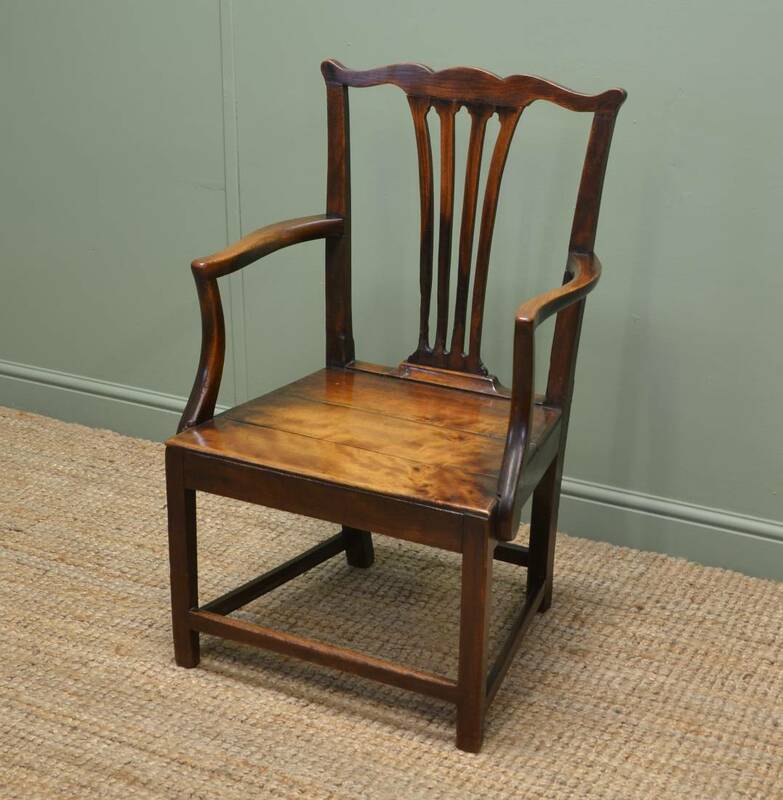 The elm has aged to a lovely, and very desirable, mellow shade with a striking grain, good patina, is in very good condition and has been beautifully cleaned using a traditional form of wax finishing. 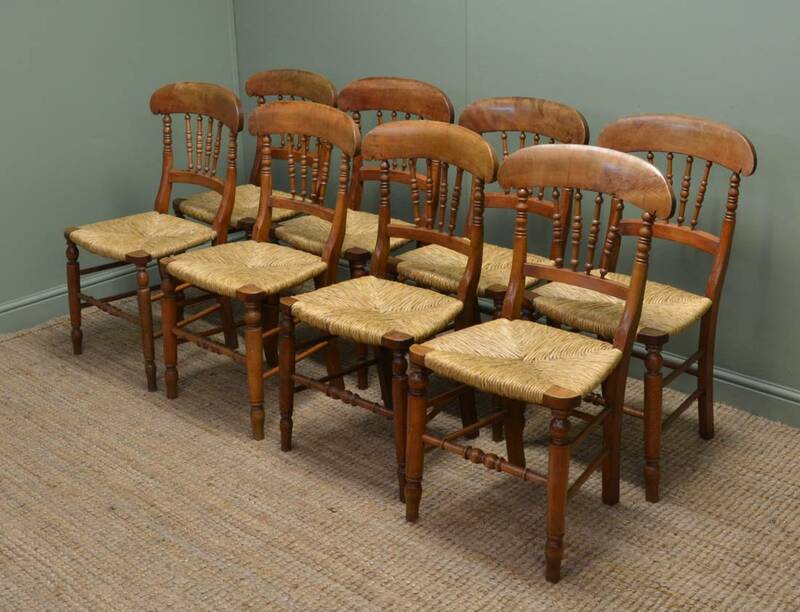 Set of Eight Charming Antique Country Chairs. 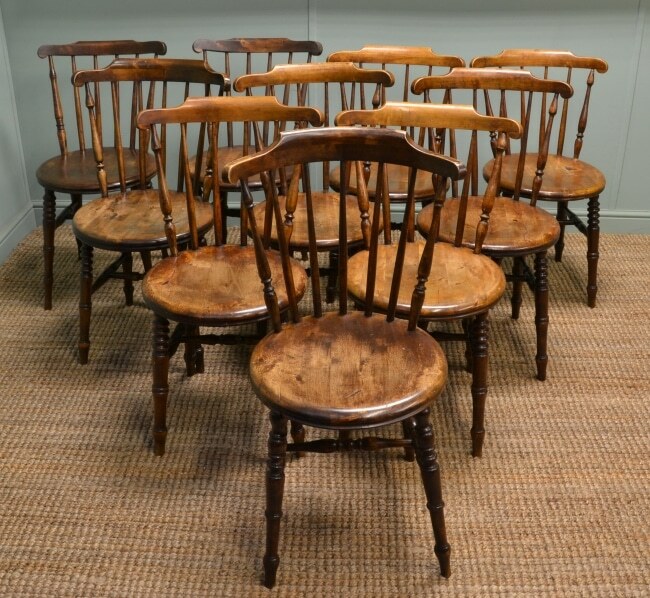 These charming country chairs are constructed from a lovely mellow beech, dating from around 1900 and come as a full set of eight. They have beautifully figured curved backs with bobbin turned upright supports. The front legs are turned while the back legs are splayed and all benefit from the added stability provided by cross stretchers making them good for everyday use. They have also been recently re-rushed, an expensive exercise and one not undertaken unless the chairs are in a good state of repair to begin with! 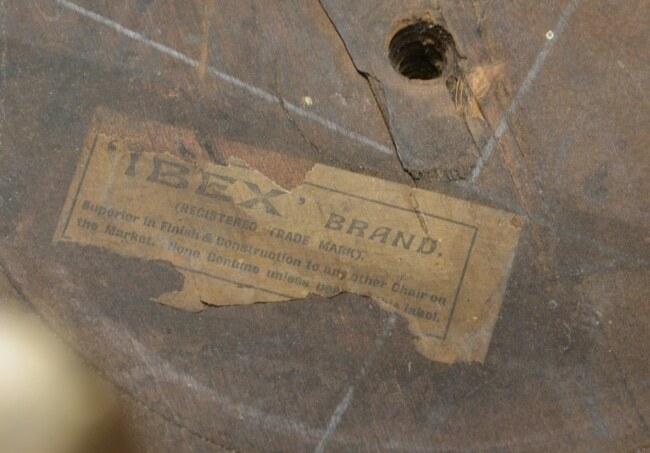 Ten Country ‘Ibex’ Antique Kitchen Chairs. 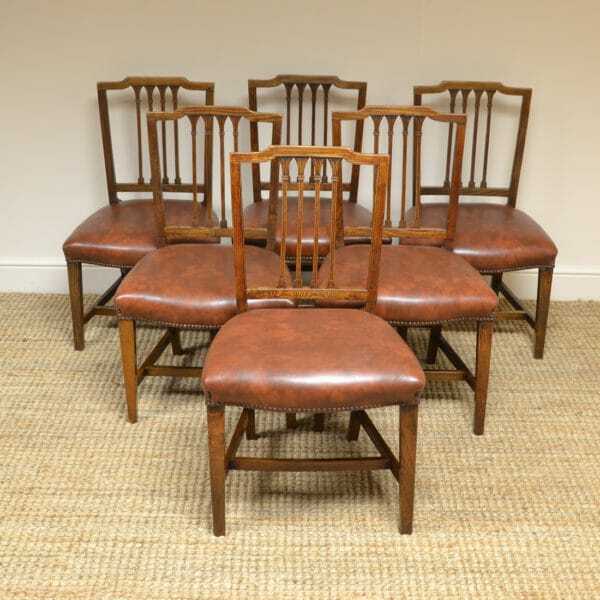 This harlequin set of ten country kitchen antique chairs date from around 1900 and are made from Swedish pine by the makers ‘Ibex’. They have curved shaped backs with beautifully turned uprights that sit within the circular moulded seat. They each stand on four turned legs and benefit from a ‘H’ stretcher for added stability. 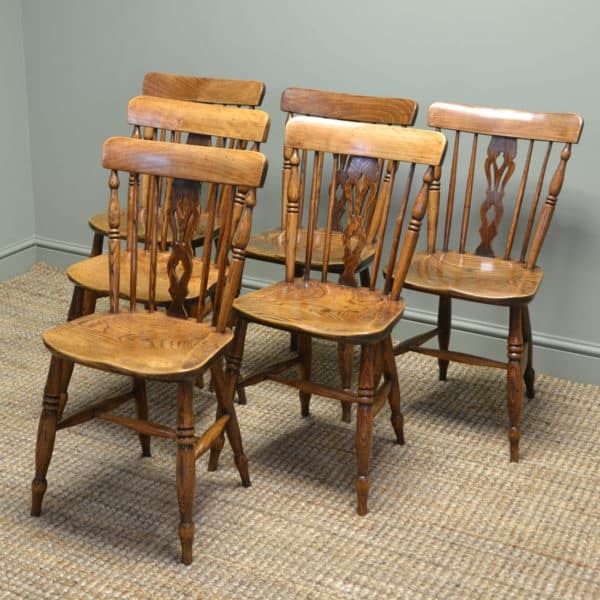 These antique chairs, whose design is very on trend at the moment, would not only look lovely around a large old pine kitchen table but their tone of colour, developed over years of use, make them ideal to put around an oak table too. 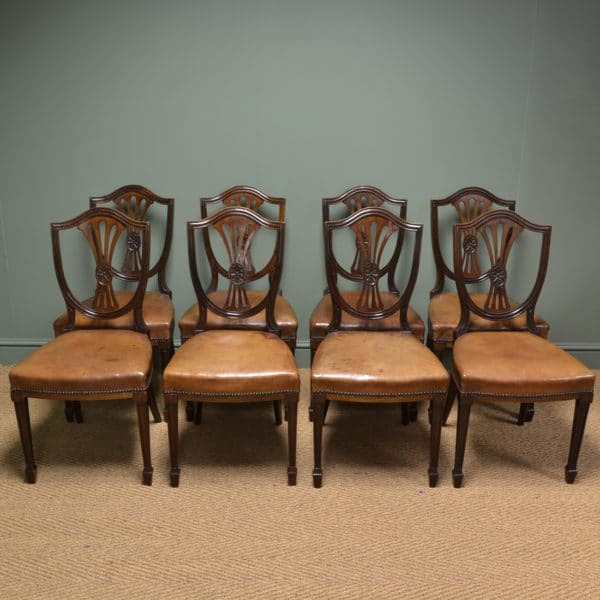 Unusual Set Of Six Country Satin Birch Victorian Dining Chairs. 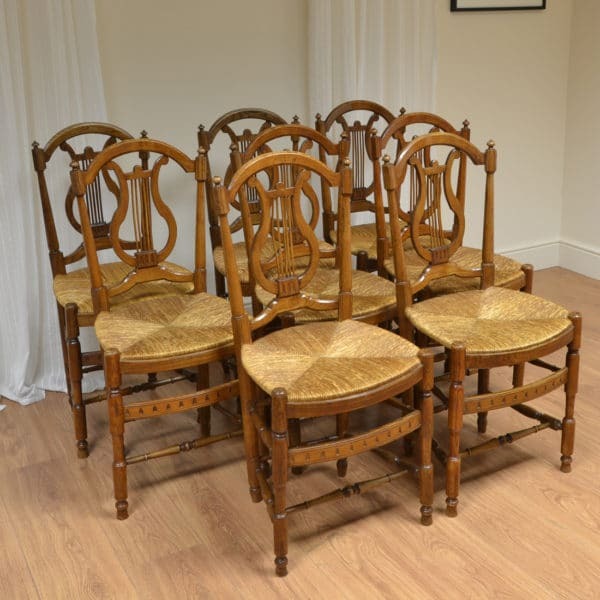 These Unusual Country Chairs are constructed from a lovely satin birch, dating from around 1850. 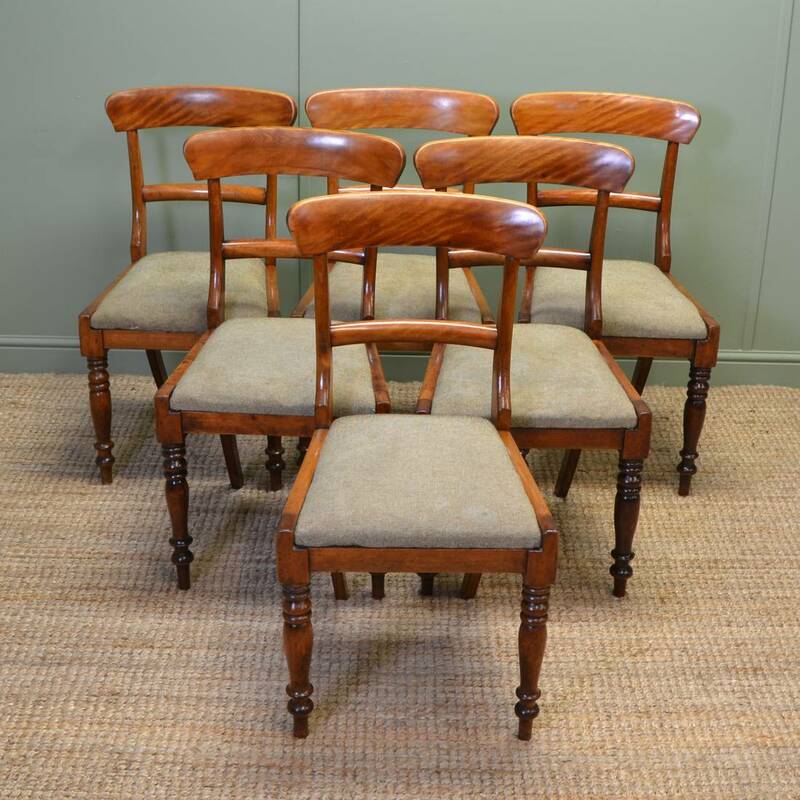 This wonderful set of chairs have shaped bar backs standing on splayed back legs and beautifully turned front legs .The chairs are upholstered in a neutral fabric and although they are slightly marked they may easily be re upholstered if desired. These fine antique country dining chairs, have wear consistent with age giving great character and authenticity. Georgian Country Pine and Birch Armchair. 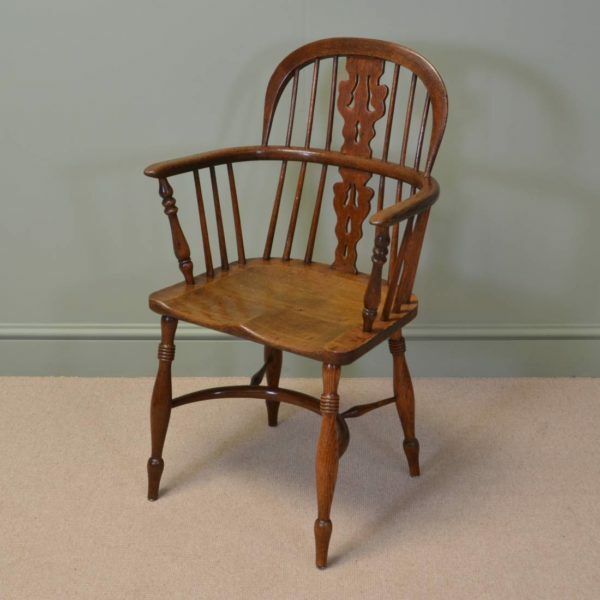 This Wonderful Georgian Country Pine and Birch Armchair dates from circa, 1790, is full of charm and character and would be ideal for a traditional country home . 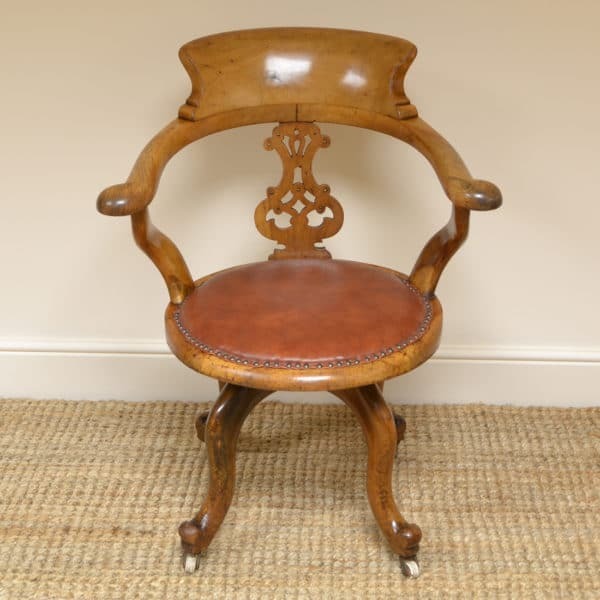 It has a lovely shaped Chippendale design back without swept arms and a beautifully figured seat. 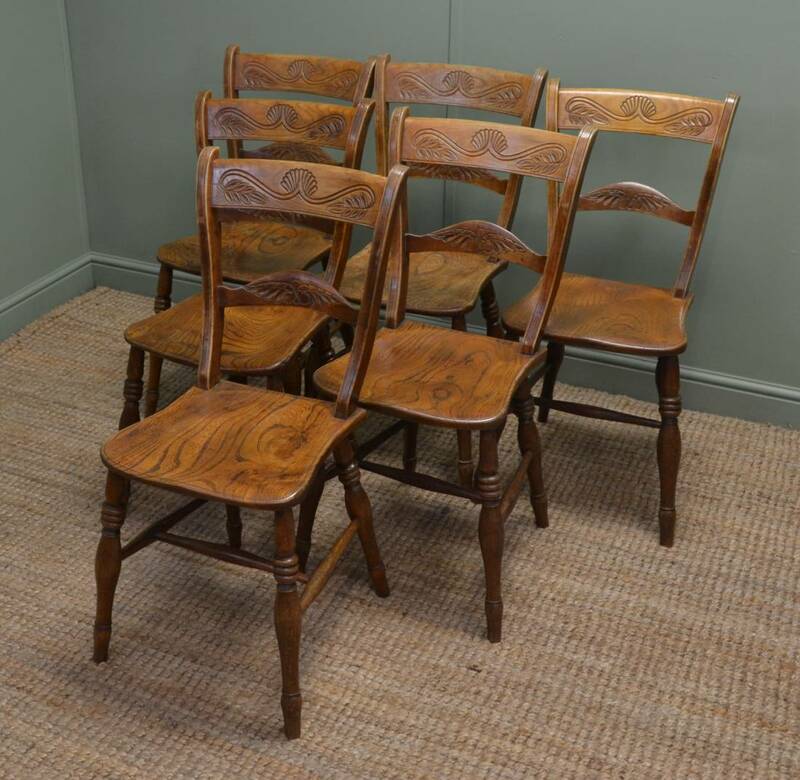 This quality harlequin set of six Arts & Crafts solid antique Oak chairs date from ca. 1890. They have unusual walnut cross banding in the backs and have beautifully figured seats. They stand on squared legs with cross stretches for added stability and are of lovely pegged construction. The chair arrived this morning, I am very pleased with it.